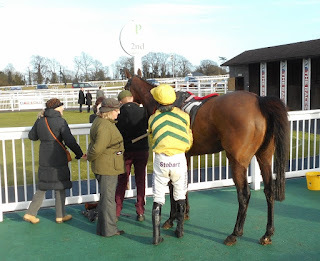 The stable, courtesy of the Valence Racing syndicates, made a raid on Plumpton today. 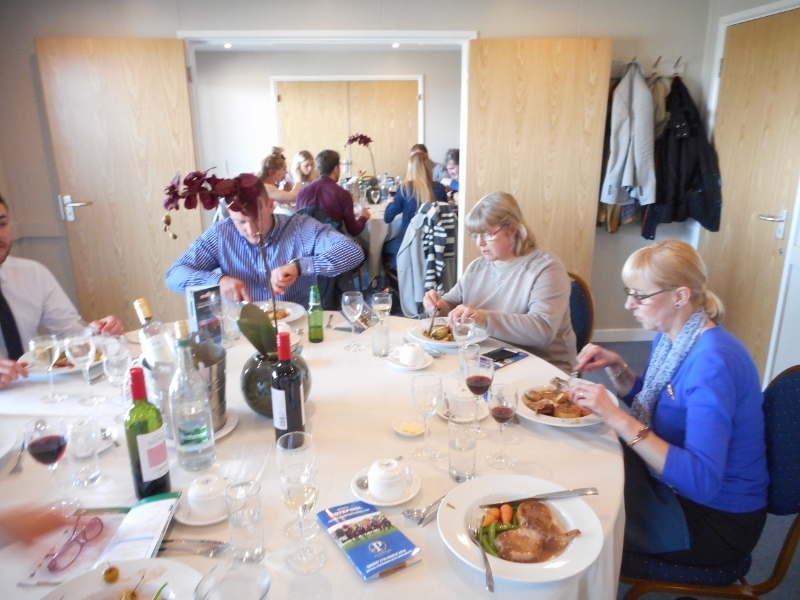 Twenty six of the owners and family hired a hospitality box for the day (a great decision considering the weather) while others opted for the Owners & Trainers bar. 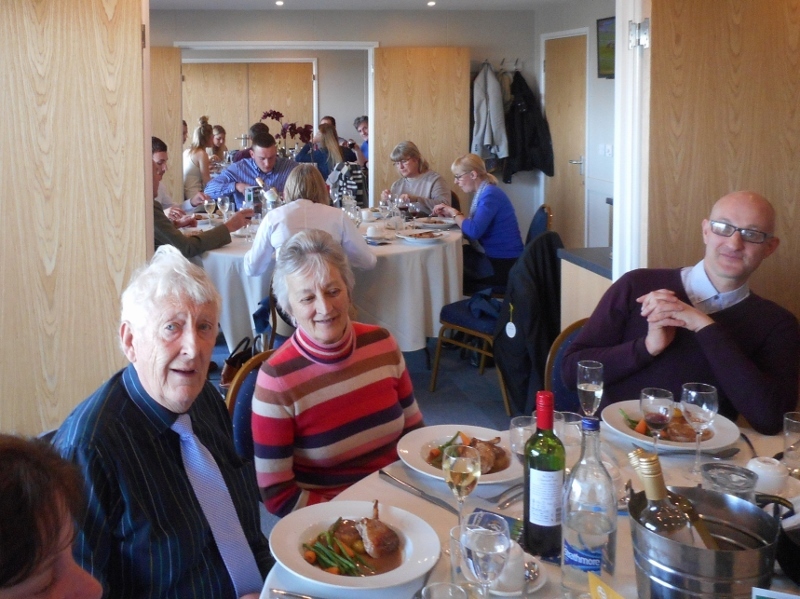 Those in the box (actually three interlinked boxes) enjoyed fizz on arrival and then a delicious three course meal to get them in the mood. Trainer, Linda, was their guest of honour. Tucking into lunch in the box, Linda on the centre table. 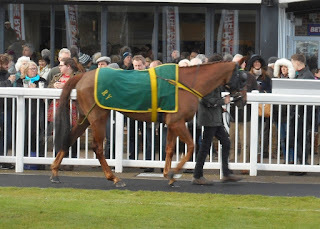 The racing side of things didn't go to plan to start with as Due South was declared a non runner in the first race because of the deteriorating ground conditions after heavy rain. Indeed the meeting only survived after a mid morning inspection. 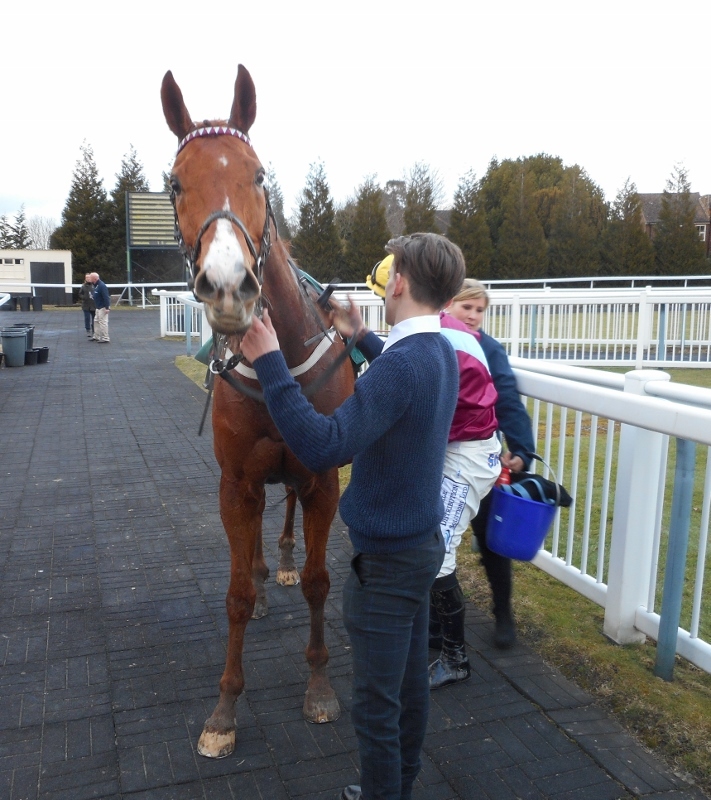 Itoldyou ran in the Sussex National, the race he had won the previous year, but he was never going with his usual enthusiasm and was pulled up with more than a circuit to go. Things began to turn more favourable when 8 horses pulled out of the last race where we had Kayflin and Fifi L'Amour running, leaving them just 4 rivals. For the first time, Linda had to declare a different colour cap for one of them to distinguish them as they had the same owners' silks. Kayflin yellow cap, Fifi blue. But which jockey drew the short straw and had to wear the dirty silks just vacated by Tom Cannon after tracking the field on Itoldyou? 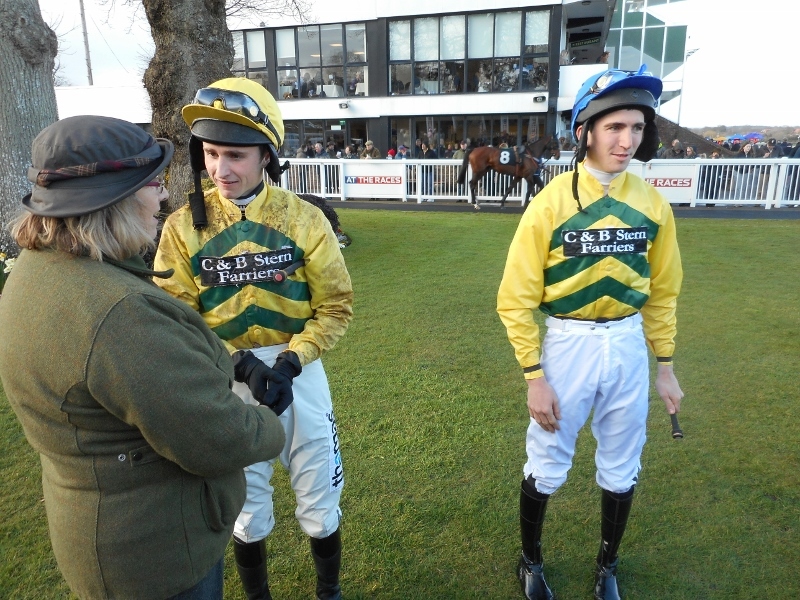 For much of the final circuit it looked as if we could get second and third but Fifi faded after the last leaving Kayflin to put a smile on everyone's faces at the end of the day when she took the runners up spot in the unsaddling enclosure. Kayflin pleases everyone with her second place. It was a morning for strings today. First the Valence Racing string went round the stable gallop. Then after breakfast it was off to the Broad Street hill gallop with Tony to watch his three work. 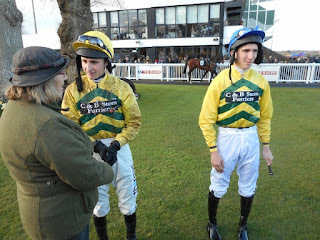 Two horses went to Lingfield today, each with something to prove. Fifi L'Amour tried just under 3 miles for the first time. 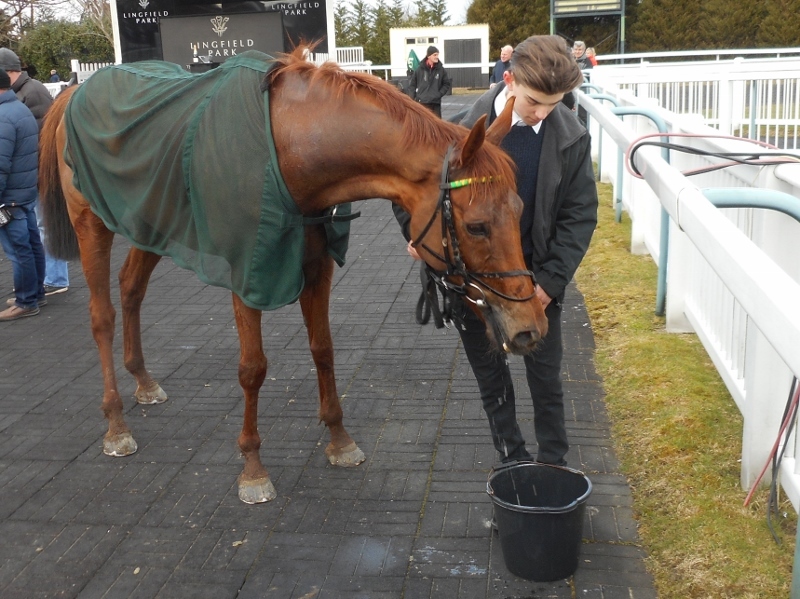 She ran in a handicap hurdle and Tom Garner settled her in the middle of the six runner field that travelled at a sensible pace in the testing ground. She wasn't totally foot perfect over a couple of the hurdles but jumped adequately. She moved into second place at the top of the hill on the final circuit and chased the leader. Entering the straight the leader found more and pulled away, leaving Fifi battling to hold her second place. The tiring ground took its toll on all but the leader and Fifi was just caught at the line and finished third. This was still a pleasing result and it added £411 to her prize fund. 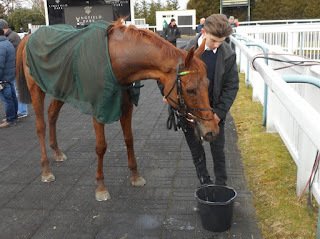 Fifi gets a well earned drink after her race. 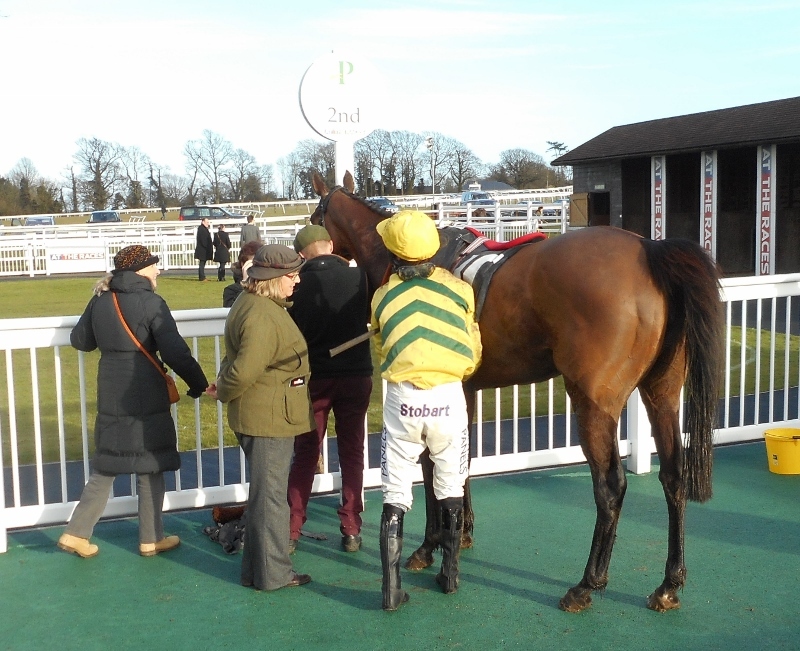 Red Anchor was the next to race, in the three mile handicap chase. After being pulled up in his previous three races retirement beckoned but he was given a chance to show what he could do with new tactics. No blinkers, cheek pieces or noseband were fitted and Tom Garner was instructed to let him enjoy himself at his own pace and not pressure him to stay with or close on the other five runners. 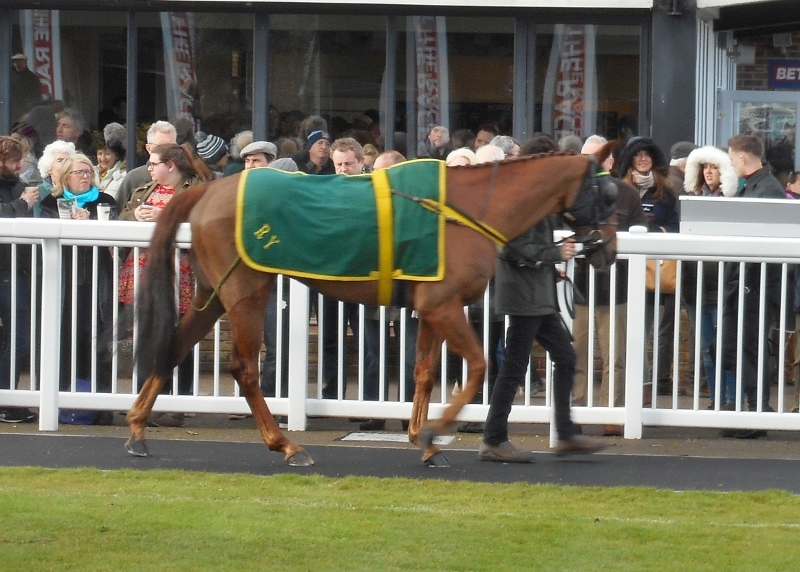 He generally jumped well but looked booked for fifth place of the five remaining runners going up the hill on the far side for the final time. Then, as some in front of him tired, his one paced galloping allowed him to move into fourth. This perked him up and he was able to pass the horse in third jumping the last. He could not get in a blow on the two leaders who had pulled well clear, but his third place was a well pleasing season's best. Retirement now may well be put on hold. Red Anchor says, "I enjoyed that." There was an air of anticipation at breakfast this morning as we welcomed some new people to the yard, who are hoping to form a partnership soon with an unraced, un-named horse. 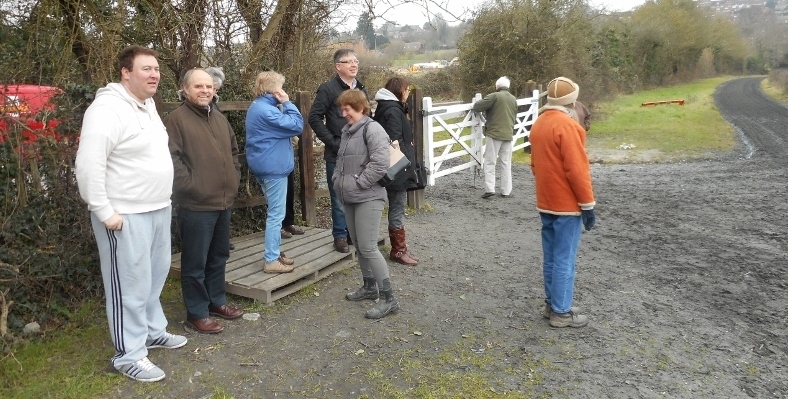 Our established owners were able to give advice and recount experiences and all enjoyed watching the horses on the track despite the biting cold. Watching the horses on the track.